I am a list maker. Each morning, in the summer, when I get up in the morning, I make a to-do list. I list all of my chores and tasks I want to complete that day. I even assign time allotments for each item on my to-do list. My to-do lists aren’t just for chores however; fun activities are also included. Piano practice, painting, bike rides and walks in the woods make the to-do list. God is also a list maker; the Ten Commandments, of the Old Testament, is a very well know to-do list. In the New Testament, Jesus adds to the commandment to-do list with 1. Love God with all your heart, soul, mind and strength, and 2. Love your neighbor as yourself. 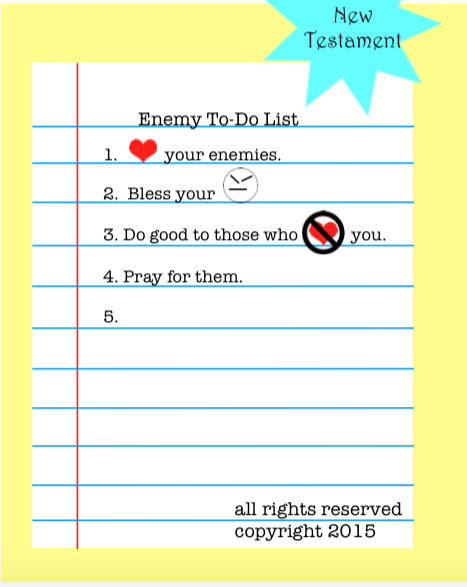 In Matthew 5, Jesus continues to challenge the culture with new directives (a new to-do list of sorts) concerning our enemies … and this one is a challenge. It involves grace. love. mercy. 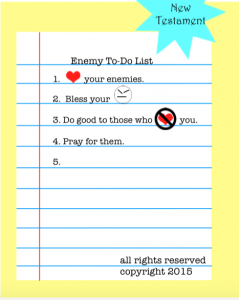 All the things we usually least feel like showing an enemy. This to-do list even has a time allotment–always. To do the Scripturegraphic Bible study, The To-Do List, please click on the link below.